This racer course in Michigan was one of my first triathlon races ever. I did remember the trail run being a challenge and for the first race this year I knew it was going to bad a hand full. And still struggling with a foot injury has not helped my training over the winter. But I figured this would be a good race to see where I stand. The swim was no big deal and I had been practicing a lot to improve my swim over the winter, so that went well but not as fast as I would have liked. Plus I did not get to warm up as much as needed before the swim getting a late start. My friend / fellow competitor Mike traveled with me and we were in the same race and that was fun. The bike section was good and went well, but again not as fast as I would have liked. Overall position was ok but not great. So I know I have some work to do after this foot gets all healed up. On the run is where the fun began. I caught up to Mike in the transition area and we both left at the same time for the run which was really cool. For the first time ever I was running with a friend during the race. Although the thought crossed my mind about reminding him who drove up and that if he did not let me win that he might have a long bike ride home. It was great running with him and he set a good pace on the trails. 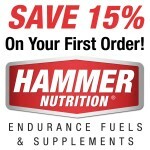 I was able to maintain my pace a bit better and my Hammer nutrition has never let me down keeping my energy up. Mike had some cramping issues at the end of the run and he finished behind me with a solid finish of 13th overall and I was 12th overall and 3rd in my age group. So my podium streak continues going into this season. The big plans this year will be to do much better at the Nationals and get ready for my first full Ironman race later this summer. Thanks to all the sponsors and everyone who came out to cheer on all the triathletes! RIM Racing is sponsored by World Wide Bearings, DNAFit, Polydyn, Timex, Hammer Nutrition, Zola acai drinks, McCabe’s Granola, Bont Shoes, HED Wheels, SRP Graphics. NE Designs provides webpage support and layout.